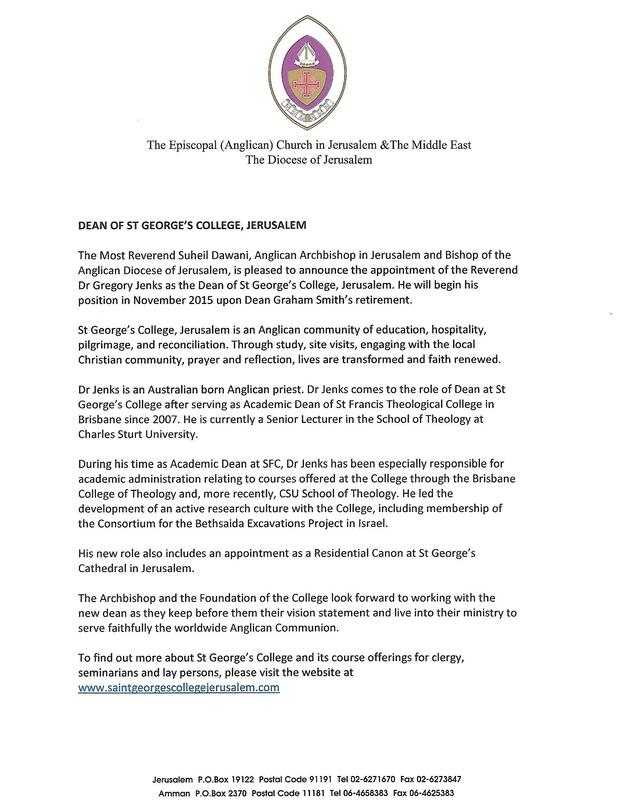 The Most Reverend Suheil Dawani, Anglican Archbishop in Jerusalem and Bishop of the Anglican Diocese of Jerusalem and the Middle East, has announced the appointment of the Reverend Dr Gregory Jenks as Dean of St George’s College in Jerusalem. St George’s College, Jerusalem is an Anglican community of education, hospitality, pilgrimage, and reconciliation. The College offers continuing education courses to students from around the world, as well as providing professional development resources for Anglican clergy in the Middle East. Dr Jenks comes to the role of Dean at St George’s College after serving as Academic Dean of St Francis Theological College in Brisbane since 2007. He is currently a Senior Lecturer in the School of Theology at Charles Sturt University. During his time as Academic Dean at SFC, Dr Jenks has been especially responsible for academic administration relating to courses offered at the College. He led the development of an active research culture with the College, including membership of the Consortium for the Bethsaida Excavations Project in Israel where he serves as its Coin Curator. Dr Jenks will take up his new role, which also includes an appointment as a Canon of St George’s Cathedral in Jerusalem, later this year. His final service at St Francis Theological College is expected to be the Valedictory Eucharist on Sunday, November 1. This entry was posted in St George's College Jerusalem and tagged SGC. Bookmark the permalink. Very good news, Gregory. Congratulations. What a wonderful career move and great chance to learnmabout the complexities of problems of the Christian Arabs.